During Our Lady’s visit to St. Catherine Laboure on November 27, 1830, rays of light flowed from rings on her fingers that were made of precious stones. However, some of the stones on the ring did not shine. 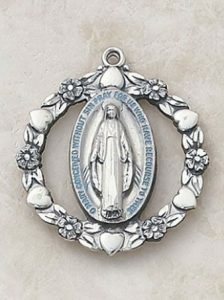 Mary explained, “These rays symbolize the graces I shed upon those who ask for them. 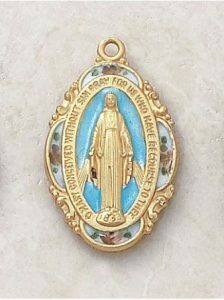 The gems from which rays do not fall are the graces for which souls forget to ask.” Mary then spoke of the medal with these words, “All who wear it will receive great graces; they should wear it around the neck. 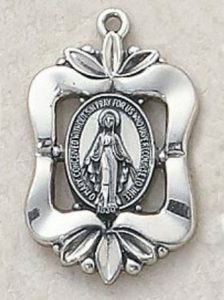 Graces will abound for persons who wear it with confidence.” The medal is simply a visible sign of the inner devotion the wearer has to Mary and to her Son, Jesus. 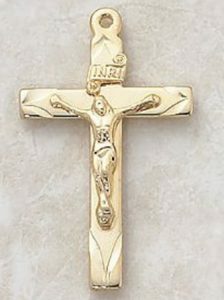 Description: 24kt Gold Plate over Sterling Silver/Enamel. Dimensions: 1″ H, 18″ L Chain. Hinged Gift Box. Dimensions: 1″ Dia, 24″ L Chain. Hinged Gift Box. 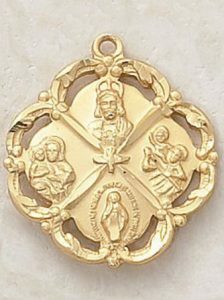 Description: 24kt Gold Plate over Sterling Silver. Dimensions: 1-1/8″ H, 18″ L Chain. Hinged Gift Box. Dimensions: 3/4″Wx1 1/2″H, 20″ Chain. Gift boxed. Dimensions: 7/8″Wx1 3/8″H, 18″ Chain. Gift boxed. 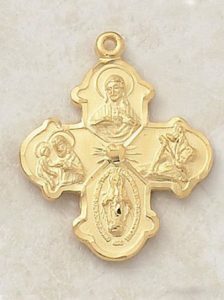 One of the most popular types of religious medals is commonly known as the Four-Way Medal. This one medal combines the bulk of four or five medals into one convenient piece. 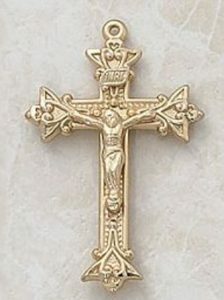 Arranged in the shape of a cross, the Four-Way medal can vary in appearance, however, the most popular form includes a Sacred Heart of Jesus medal, St. Christopher medal, St. Joseph medal and the Miraculous Medal. 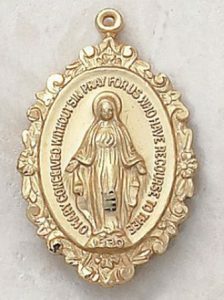 Some The reverse side of the medal will often contain the inscription “I am a Catholic, please call a priest.” This traditional message is included in case of emergency so first responders will know to call a priest to administer the Sacraments. Dimensions: 1 1/8″ H, 24″ L Chain. Hinged gift box.